The duo behind renowned New York City studio Roman and Williams give Dwell a first look at the interior they designed for Upland, a new restaurant from Chef Justin Smillie and acclaimed restaurateur Stephen Starr. We interviewed Roman and Williams principals Robin Standefer and Stephen Alesch about emotions and food, how the Badlands differ from SoCal surfer culture, and how to create a relaxed vibe through materials. 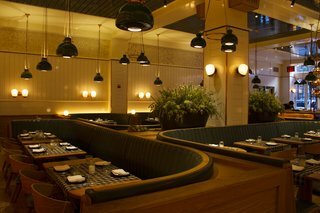 Roman and Williams designed the interiors of Upland in New York City, a restaurant from Chef Justin Smillie (formerly of Il Buco Alimentari) and his partner, acclaimed restaurateur Stephen Starr. 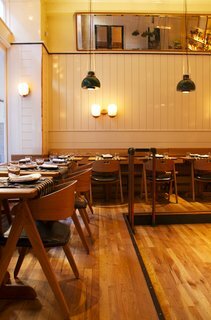 Named after the Southern California town where Chef Smillie was born, Upland opened on October 28, 2014, and offers California-inspired cuisine in Manhattan's burgeoning Nomad district, on Park Avenue and East 26th Street. How do you approach each individual restaurant/hospitality project? Where do you start? What was the design brief from Justin Smillie and Stephen Starr? We have a really emotional relationship with our clients, particularly when it comes to a restaurant project. We rarely get briefs, but instead start with the food. The inspiration for the food, and the words that describe the food and its essence, really are the inspiring force behind our design. Hospitality projects have a narrative as well, but it’s not quite as direct as with a restaurant. With a restaurant, it’s about feeding people, an essential act that we all engage in, and we start with that narrative and those inspirations. The food drives the details of design. The millwork throughout Upland is white oak with copper accents; wall paint is the oil-based Hollandlac line from Fine Paints of Europe. How did you translate a feeling of California to a New York restaurant without resorting to cliché? What is the 2014 version of "California"? Our connection to California on this project was Smileys connection to Upland – it’s where he grew up. It’s part of the "Inland Empire"; the Badlands is its nickname. It has nothing to do with surfing, Randy Newman’s I Love LA, or Hollywood. It’s an amazing, agriculturally significant cradle of earth at the foothills of the San Gabriel Mountains where citrus, olives, grapes and other things have been the focus for 100 years. The California we are focused on now is high quality ingredients, its history of immigrants and their food culture, and the farming backgrounds of its oldest families. There’s much less focus on the beaches. 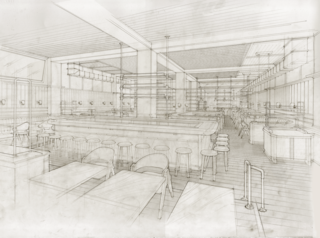 An original Roman and Williams drawing showing the design for the new restaurant Upland in New York City. What sort of interior touches (furniture, lighting, materials) can translate to a residential environment? How much residential/contract crossover do you find in your design work? Creating a soulful space is about using things you love, and when you truly connect with an object, it works in every environment. Methods that we love to use in restaurants or hotels can work equally well in a residential environment, and vice versa. There is a lot of crossover between the two. Restaurants fulfill an essential human need, eating. We love cooking and are very inspired by food, so that essential quality paired with a love of the medium of food draws out a lot of our creativity. 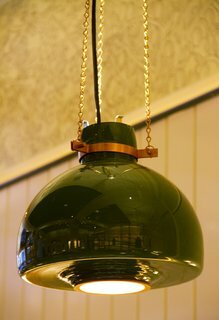 It’s also really fun create custom items for our spaces, and mix them in with vintage finds, a practice that works well in both residential and commercial work. In everything we design, we want the end result to be a livable, comfortable environment. We believe that the key to designing a great public space is to make it feel a bit like home. Both are really about designing a place where people feel comfortable and want to spend time. The floors throughout Upland are #1 Common white oak. The antique mirror on the back wall was sourced from Mirror Fair and customized by Roman and Williams with a white oak frame. What’s the key to creating the right vibe in a restaurant in terms of environmental design (everything from lighting and sound absorption to the layout of the restrooms)? 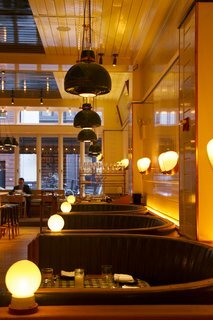 Lighting and color has a huge impact on a space – we like to keep our restaurant lighting low and warm, and the colors a bit surprising. We use a lot of points of light which have been dialed down, to keep the lighting low but plentiful. That’s what makes something feel sparkling, beautiful, and special. The deep greens and fresh whites in this space, combined with the copper touches, create a very lively yet relaxed environment. Colors are always inspired by nature, in this case, the hillsides of California. The greens are the lush, rolling farmlands; the coppers are inspired by how that verdant hillside can change during a drought or cold season. These elements really define the intent of the space and enhance the California vibe of the food. 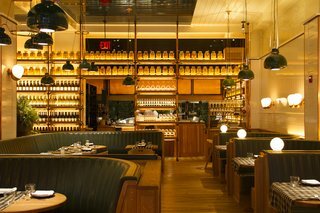 Leather booths line one wall along Upland's interior; windows look out onto Park Avenue South. The rich material mix continues elsewhere; the bathrooms are outfitted in tile from Design and Direct Source and the stairs sport rubber flooring from Pirelli. 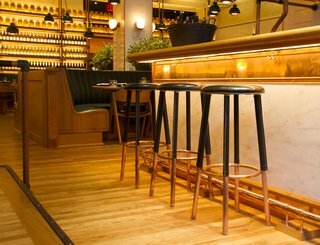 Upland's bar is topped with Calacatta Gold marble; the custom bar stools are in painted oak. 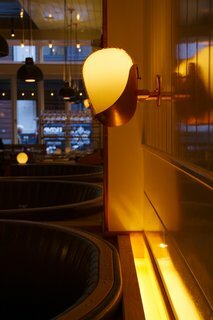 All the lighting in the restaurant was custom designed by Roman and Williams. Herves Descottes from L’Observatoire served as lighting designer on the project (who also worked on the firm's interior lighting for The Dutch and Lafayette). Custom wall sconces in cast glass and copper were designed by Roman and Williams. Visit Upland at 345 Park Avenue South at 26th Street.